With a budget of about US$ 61 million “The Mermaid” counts an opening day record of US$ 41 million. 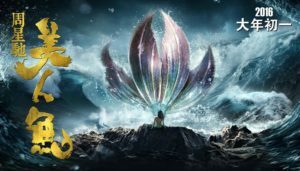 Amongst others like “The Monkey King 2” (also shot in 3D with STEREOTEC Rigs), “The Mermaid” lead the Chinese Box Office breaking all records worldwide for biggest box office in a week (US$ 548 million, 2016 Feb 8-14). After three weeks in theaters “The Mermaid” for its own nearly reached the mark of half a billion US$. This romantic comedy movie was shot with 2 STEREOTEC Light Weight Rigsand RED Epic cameras. The rigs were used on crane, dolly and tripod. Stereography was done by Stego Zhang.